Growth: Development of the Built Environment. Over three days each workshop explored the notion of ‘Environmental Capital’ and both discussed and built ideas for the features of an environmental capital. 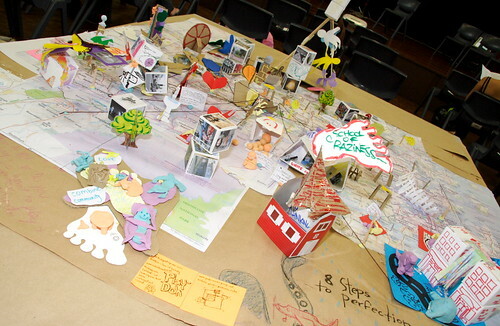 Creativity underpinned our process for the workshops where a playful but intensive period of activity involved social mapping, StoryCubes and 3D mapbuilding. a physical landscape of cubes building up over the days. StoryCubes are a tactile thinking tool for exploring relationships and narratives, each face of the cube is illustrated or annotated to graphically convey an idea, a thing or an action. A 3D Map of a Future Peterborough to make manifest participants ideas for the features of an environmental capital and go beyond the big ideas such as ‘a carbon zero economy’ to look at how that might be achieved on the ground. Participants added both new ideas, suggestions and existing or planned buildings, structures or initiatives. View a film of the collaborative map created over the first three days.